The 2017 Major League Lacrosse collegiate draft may end up producing one of the deepest classes the MLL has ever seen. Every team came out with at least one guy that can make a huge difference in their organization. Some teams even got two or three guys potential impact guys. Here are Bailey Kennedy’s thoughts and grades for each team’s draft picks. I am still a little confused about the way the Blaze drafted. They had the #6 pick and there were some great players on the board, including Zach Currier (who the Outlaws took when the Blaze traded the pick), Jake Froccaro and Sergio Salcido. Instead, the Blaze traded the 6th pick for the 9th pick, the 18th pick and the 36th pick, plus Brent Hiken. Without this trade the Blaze would only have had six total picks but earned two more here, and I wasn’t blown away. The Blaze trading back and drafting Jake Withers was shocking considering the Blaze need help at midfield but instead took a face-off guy. Although the Blaze have struggled at times this year the X, it was surprising to see Withers go this early. Don’t get me wrong; he is great and had an amazing year for Ohio State but if the Blaze waited they could have gotten him with their next pick. Not to mention the fact that Withers hasn’t made a commitment to playing MLL yet; for all we know he may not suit up this season. The next two picks made by the Blaze in Notre Dame’s Garrett Epple and Denver’s Christian Burgdorf at #18 and #20, respectively, really bolster this young Blaze defense alongside a great LSM in Scott Ratliff. The rest of the Blaze’s draft didn’t really blow me away and I feel like in the end they didn’t fill areas of need for the team. The Cannons added depth at midfield with Sergio Perkovic and Eric Scott. Luke Goldstock is a pick that I really like, although the Cannons are pretty solid at attack already, so it wouldn’t surprise me if the Cannons use his great scoring ability as a player that they can use to run out of the box to play offense. Corpolongo also provides the Cannons with a great scoring presence from midfield scoring 33 goals this year for Stony Brook. I can’t really see him playing many games this year at least for the Cannons. The rest of the draft the Cannons essentially took great local guys. Charlie Fay from Bates had a incredible NCAA career. The Cannons added also added Ian Yanulis, a short-stick defensemen from Duke who is from Massachusetts. With their last two picks they took two players who have the Sean Quirk connection: Brendan Dooley, who played at Springfield where Quirk played, and Tom Hughes, who just finished his playing career at Endicott where Quirk was once his head coach. After the Cannons first four picks they really focused on getting New England guys who they know they could call at the drop off a hat to come down and suit up. How would I describe the Hounds draft in a couple words? Just ehh. The Hounds had 12 picks in the draft, and really didn’t blow me away with any of their picks outside of Rambo at #3. Rambo is a slam dunk for the Hounds and he makes their attack unit scary. Rambo will most likely be getting the third best pole on every team and I think he’ll take advantage of it. This is because at attack he has the talented shooter Ryan Brown alongside him, and then the sneaky man back at X in Joey Sankey. Adding Rambo makes this maybe one of the best trios at attack in the league. I liked the Hounds taking a tough short-stick defensemen in Jack Adams at #15 and I think he will be a great fit and will see playing time right away in the MLL. The only other player I really love t was Richmond LSM Brendon Hynes, someone who dominated the year. He caused 50 turnovers on the year and scooped up 74 ground balls. Anyone that can cause that many turnovers in college will be a solid player in the MLL and I think his ability to cause turnovers will be huge and make him a impact player early, giving opposing teams threats nightmares with his abilities. The rest of the Hounds draft was okay but I was not really blown away. Brian Sherlock, who the Hounds got at #24, will be a good offensive midfielder with his deadly shot but it might be hard for him to get on the field right away. The Bayhawks did a solid job of drafting and all in all I really liked what they did. 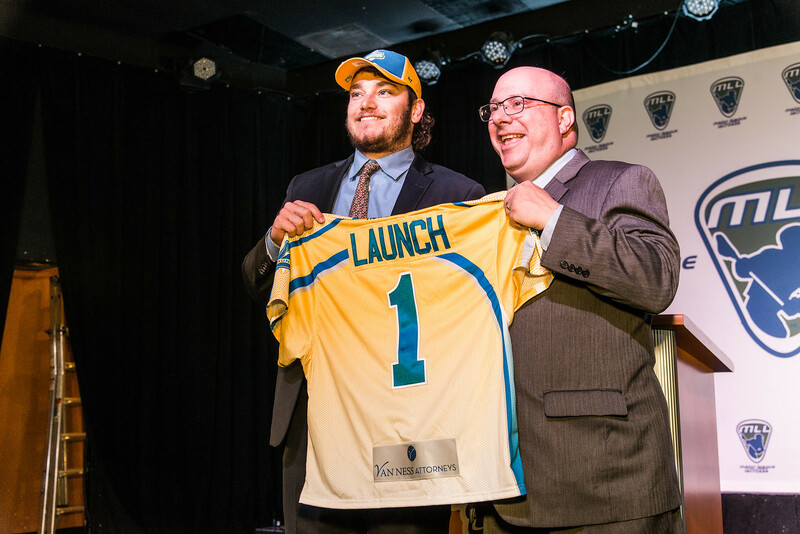 The Bayhawks originally held the #5 pick but made a move and traded away the pick to the Ohio Machine for the #7 and #12 picks in the draft. I think the player the Bayhawks were looking for at #5 was Maryland legend Matt Rambo, and once he was off the board the Hawks realized they could get a solid deal to move down. With their pick at #7 they took a great player in Jake Froccaro who can really do it all as a midfielder. Pair him alongside Myles Jones and that’s a scary 1-2 punch. Following the Froccaro pick the Hawks then took a Maryland great at #11 in Colin Heacock. He’s a true attackman who could be used as a player who can come out of the box for the Bayhawks and give them a great scoring threat from midfield. Following that pick they took a great LSM in Matt Rees who may not be able to come in right away because of his required military service, but he is someone they can use to either pair with CJ Costabile or move one to close. At #16 the Hawks also got a great SSDM in Isaiah Davis-Allen who will be great addition. He is tough guy who you can even keep Myles Jones out their to play both ways, those two guys become a scary two out there on defense. The rest of the Bayhakws draft was honestly great, taking Josh Byrne at 19 who can score and Nick Aponte from Penn State. They really brought in a lot of great goal scorers to bolster their offense. But the Bayhawks drafted another great Navy player in Chris Fennell who played with Rees, and the real question is how long before they can suit up? If they can right away those are two huge gets for the Hawks. The Bayhawks have been struggling at the X this year so taking two FOGO’s in Ben Williams at 38 and Stephen Kelly at 48 makes sense. If one is struggling, put the other in. The defending champions had a solid draft day, making a big move trading up to the #6 pick where they chose Zach Currier, and I love the pick. Currier is really a do-it-all guy. He can play wherever and do whatever you need him to do. He takes face-offs, sets up the attachment and is a threat to score himself, not to mention he can scoop a ground ball away from anyone. The Outlaws had a solid draft selecting a lot of all-around players but the two guys that I think really will make a huge impact for the Outlaws are Larken Kemp and Tanner Scales. Kemp has changed the game for LSM’s; now every LSM has to have great stick skills, be able to scoop up ground balls for days and score at will. 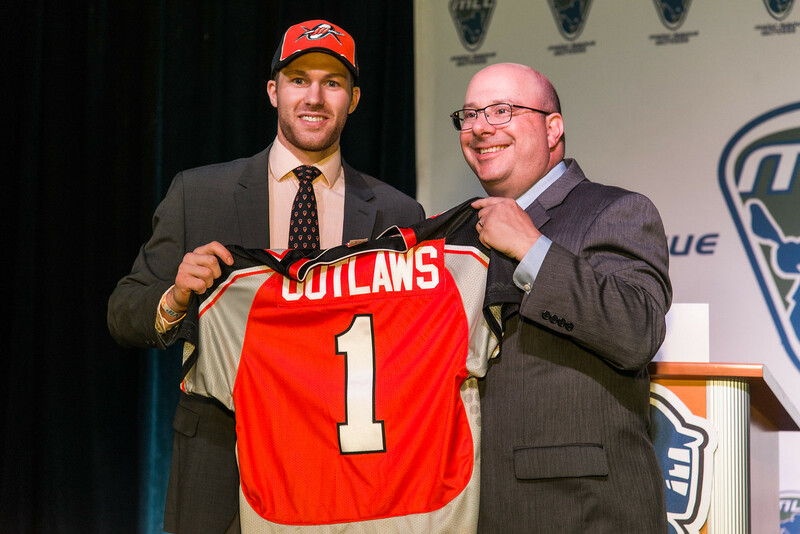 It will be exciting to see how the Outlaws handle this talent in the MLL. He is similar to Scott Ratliff at the LSM position but the big difference is Kemp is a better scorer than Ratliff. If the Outlaws let Kemp run free and do what he did at Brown, their offense just got even better with the addition of a LSM. At #56 the Outlaws got a great defensemen in Scales. Scales was injured a lot in college where he could have easily been one of the best defensemen in this draft if he’d been healthy. His past injuries haven’t hurt him much, and if there is any team that will be able to get the best out of Scales it’s the Outlaws. Who knows if Scales even plays this year, but he is 100% a future pick for the Outlaws and I think he will be a great future defender for them. The rest of the MLL needs to take notice: the Florida Launch are here. After this draft the Launch are seriously locked and loaded and honestly might be one of the scariest up and coming teams in the MLL. Since joining the MLL in 2014 they’ve struggled, going a combined 13-29, and have never finished better than 2nd last in the MLL. Last year the Launch had the worst record in the league, and they went full rebuild mode by trading for 1st round draft picks left and right, ending up with four of the first 10 this season. And they nailed every single pick. With the first pick they took former Tewaaratoon winner Dylan Molloy. Molloy is a superstar. You add him to a Launch team that already has such talented players in Kieran McArdle and Chazz Woodson and that trio is scary. With Molloy coming in expect to see Steve Pontrello come out of the box for the Launch instead of leading the attack. The two other picks the Launch used in the 1st round got them teammates in Nick Mariano at 4, and Sergio Salcido at 8. These two had breakout years for Syracuse which will be a huge impact for the Launch right away. Add those two to a solid duo that the Launch already have at midfield in Connor Buczek and Steven Brooks and that’s a solid core. With the 10th pick they took a great defender in Tim Muller from Maryland to add alongside an uber talented Turker Durkin. The Launch’s close D got even better by adding Providence’s Jarrod Neuman with the #25 pick. Two of my favorite picks for the Launch were getting a clean defensemen in Alec Tullet who is also a scoring threat as a pole in transition, and Benny Pugh at 37 who was unreal between the pipes for Richmond this past season. Although Austin Kaut is a solid goalie for the Launch, it wouldn’t be surprising if the Launch gave Pugh a chance this season. The Lizards’ defense has been underwhelming so far this season, so it was good to see them try to fix that with their first two picks. Austin Pifani had a incredible career at UNC, and he’ll be a solid defensemen for the Lizards. He will also be teaming up with Scott Firman from Syracuse who turned into a lock down defenseman this year. The Lizards defense is getting old and you have to look for young talent to pair up with one of the better young defensemen in Joe Fletcher. Outside of those first two picks, Tucker James is a solid pick from Bryant but the Lizards have so much offensive talent it will be hard for him to touch the field. Possibly the steal of the draft could be former Marist attackman JD Recor who was a ninth round pick. Recor is Marist’s all time assists leader with 131 and is also the school’s second all-time leading scorer with 222 points. Recor was a steal for the Lizards, and honestly could see playing time soon, since he isn’t a score-first player like many of the stars are – he’s a pass-first guy, which is something that could definitley help the Lizards offense become more dangerous. The Ohio Machine have to be thrilled to get Connor Cannizzaro by trading for the #5 pick. The Machine are without Steele Stanwick this year, and Cannizzaro could easily fill that hole. The Machine’s attack so far this season has consisted of Mark Cockerton, Marcus Holman, and Logan Schuss who is back playing for the Machine. It wouldn’t be surprising if the team starts sending Cockerton out of the box for the rest of the year and lets Cannizzaro stay on the field as a true attackman. With the #26 pick the Machine took a solid defensemen in Nick Fields, who was an anchor for a young and inexperienced Johns Hopkins defense the last two years. Fields’ leadership capabilities will help him fit in well with a more experience defense. At 32 they picked Joe Seider from Towson, who gives the Machine another scoring threat, and someone who can fill in right away for missing guys. Drafting Ohio State’s entire available midfield was a great move. At 53 they took Johnny Pearson, who really did a great job of putting the ball in the back of the net and has a cannon of a shot. Ten spots later they took Tyler Pfister who is a solid 2-way guy, one of those guys who isn’t great at one specific thing but is solid at a basically everything. At 71 they took JT Blubaugh, who just like Pearson is a great scoring midfielder. The three already have experience playing together and will come as a great package deal, and with Kyle Harrison being out with an injury expect one of those three to step right in and play. If Tom Schreiber returns to the NLL in 2018, drafting local, available, Ohio guys could be huge. The Rattlers not having a first round pick really hurt them although they made the best of it. Eric Fannell is coming off a great run with Ohio State, but who knows what he will do. Being from Ontario, there’s a be a good chance he’ll just stick with box lacrosse where he will definitely find great success, but it’ll be a loss for the Rattlers. I do love their pick of Zed Williams at #22. Williams can play wherever the Rattlers need him to. At Virginia he played both midfield and attack. Williams is really a do-it-all kind of guy, and I think he could be a great fit for the Rattlers. In the end I think the best pick may have been the Rattlers selecting Jack Bruckner at 39 from Duke. Bruckner is a great talent and I think he could find his way onto the field right away for the Rattlers. 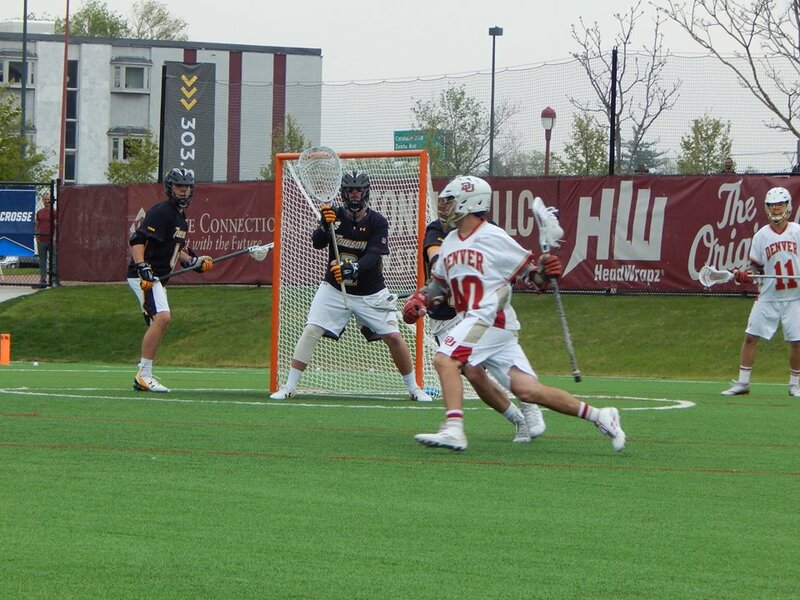 When you look at the Rattlers it feels like they are missing the offensive threat at midfield and that is what Bruckner is, a score-first midfielder and that will be huge for the Rattlers to add. Kyle Rowe will also be a solid add to the Rattlers as a FOGO.